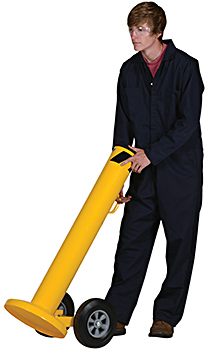 Bollards are protective barriers that play an integral role in safeguarding workers, buildings, racks, and machinery. 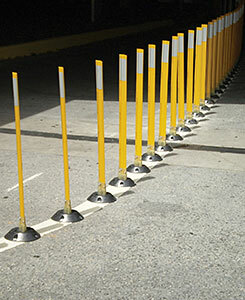 When used with chains, bollards are ideal for cordoning off larger areas. 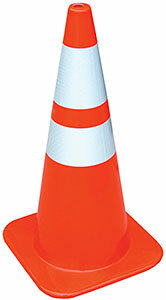 At HOF Equipment Company, we can handle all of your Bollard needs, from industrial to decorative models. Our inventory includes an assortment of permanent bollards, removable bollards, parking bollards, traffic bollards, and folding bollards by Vesil. In the case of removable bollards you may choose from surface mount and sleeve in concrete styles. There are various heights, colors, and diameters to select from. Protect larger areas with optional D Rings and chain to link bollards. Have a question about Vestil bollards? Simply give us a call or send us an email today! A knowledgeable member of our team is always ready to answer your questions and provide you with the information you need. We're constantly updating our inventory with new material handling products, so check back often. HOF Equipment Company has the equipment you need to get the job done.